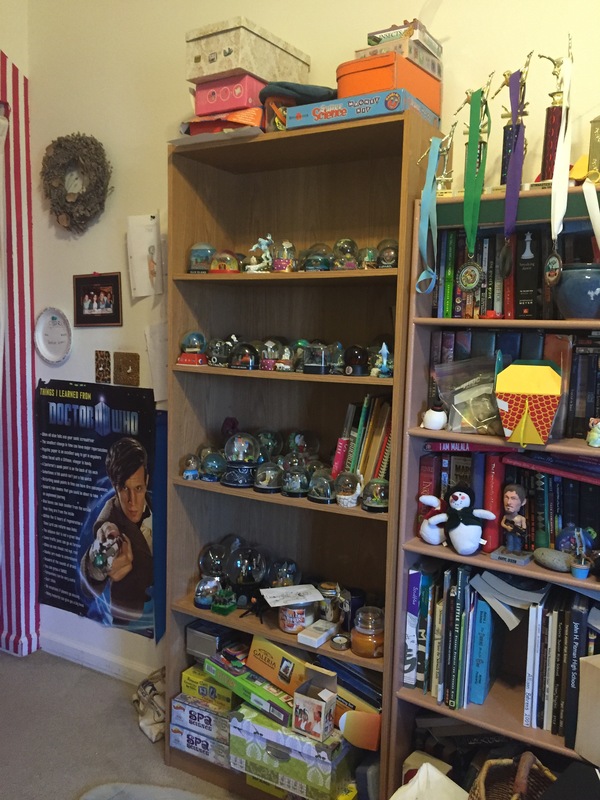 You’ve seen my bookcases. Now it’s time to see what my family has. This is my husband’s nightstand. I find his contribution to the family book collection unacceptable, especially since these are his only books. Tsk tsk. The older daughter helps make up for her father’s book inadequacies. Her room contains three cases. 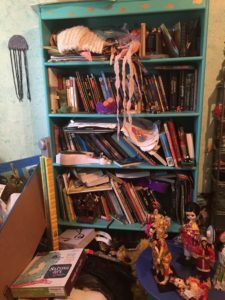 As you can see, one is filled mostly with her snow globe collection, but her cookbooks are there too (she owns more, but the rest are currently scattered elsewhere as a result of her summer baking habits). 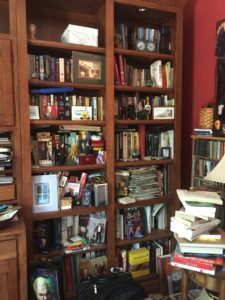 The right-hand case has most of her books. But the third case is tucked near her bed. 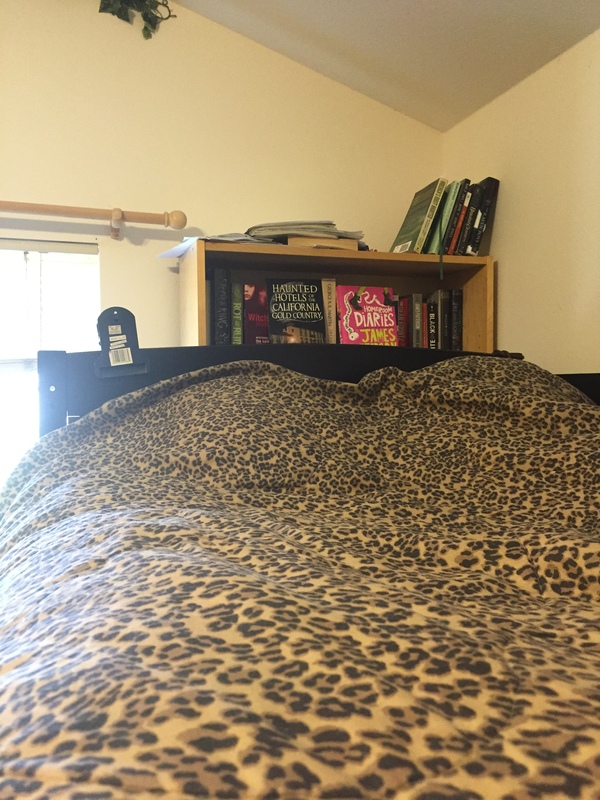 Only the top couple of shelves contain books; you can see some of that peeking above the top bunk of her bed. 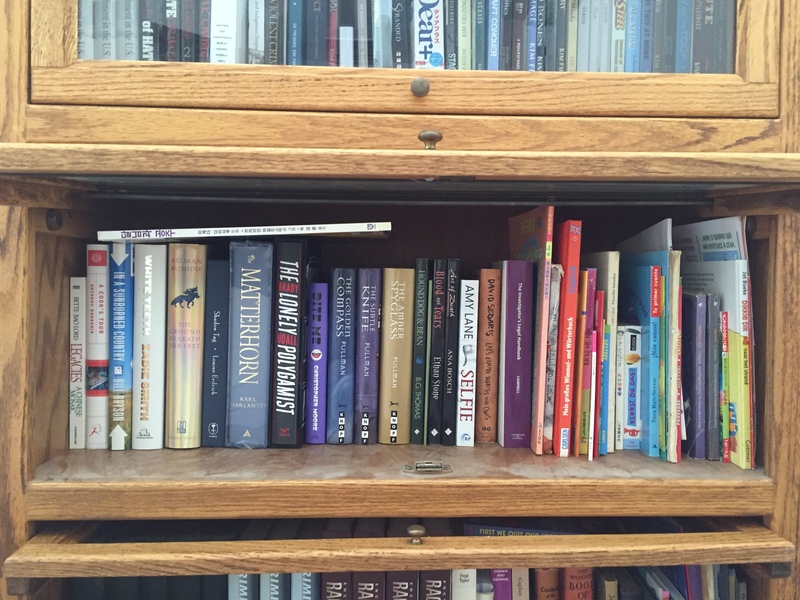 The rest of the shelves have school papers, books, and god knows what else. 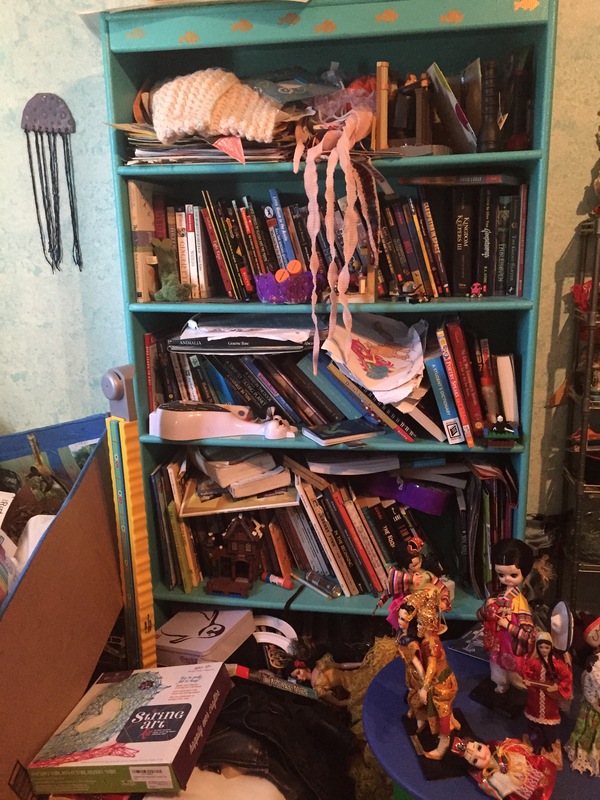 And finally, we have the younger kid’s case, the condition of which is indicative of the state of her bedroom in general. Somewhere in that room, I’m pretty sure we could find the Holy Grail, Jimmy Hoffa, and the lost city of Atlantis. And quite a lot of books. That’s it! The complete tour! I have more bookcases at the office, but that tour is less entertaining, I think. This is part 2 in a 3-part tour of the bookshelves in my house. This is in my study. It’s a bit, um, crowded. 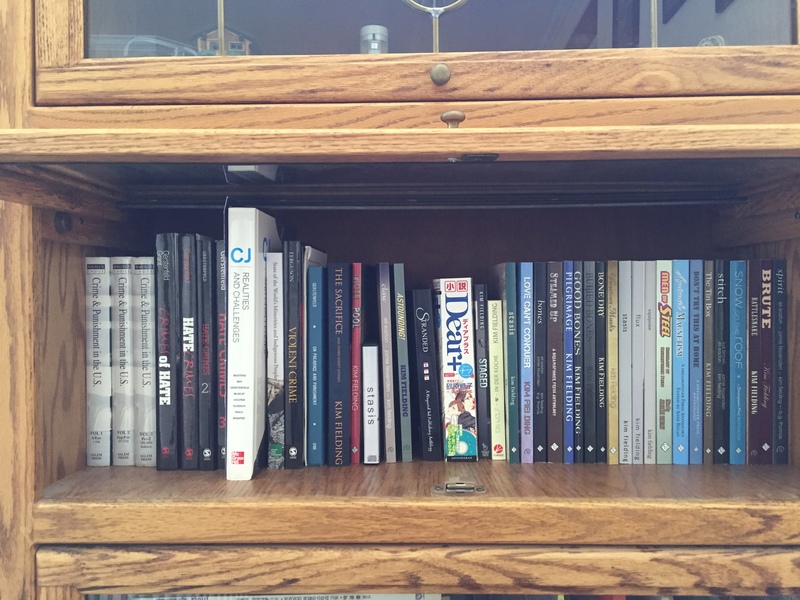 Most of the books are double-stacked, plus there’s spillover on the little table on the right. Then we have my Spike figures (and his friends), my postcard collection, and various bits and bobs I’ve collected during travels. The whole study’s like that. I rarely work in there, actually. I do most of my writing at the kitchen table. One of the living room cases. 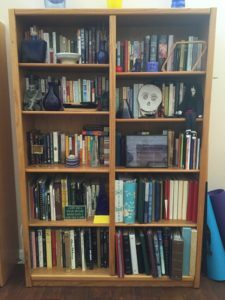 This one has some fiction, art books, photo albums, and yearbooks. My husband and I went to the same high school, which is why you see doubles for the yearbooks. You can also see my knitted Joey Ramone, plus a few other things. 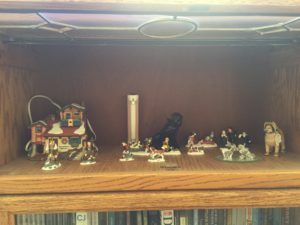 The second living room case. 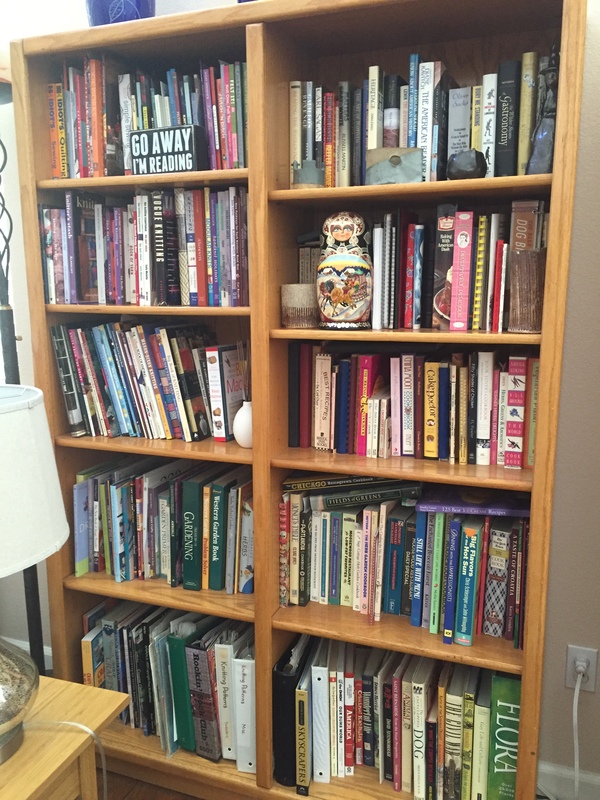 This one has cookbooks, craft books, and gardening books, plus a shelf or so of general nonfiction. 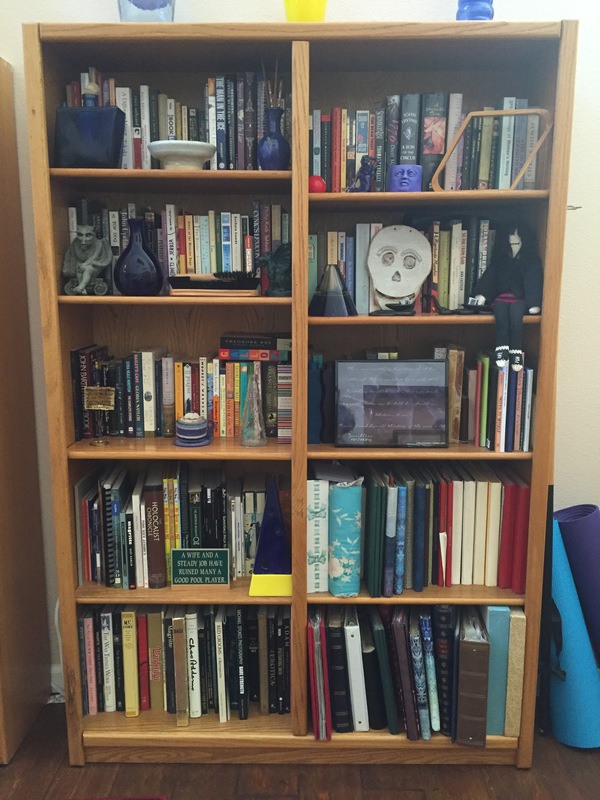 I try to keep these bookcases semi-organized, but am only partially successful. The third living room case. 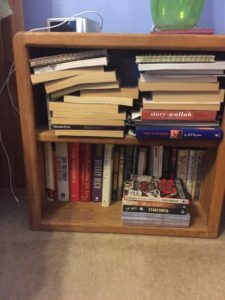 Travel books, fiction, and a lot of nonfiction. It’s almost entirely double-stacked. Can you spy my beloved copy of CMOS (Chicago Manual of Style)? 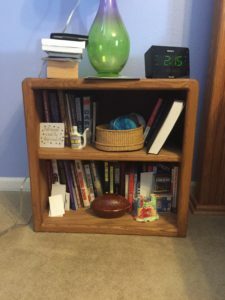 Instead of traditional nightstands, we opted for more bookcases. Here’s mine. Double-stacked. 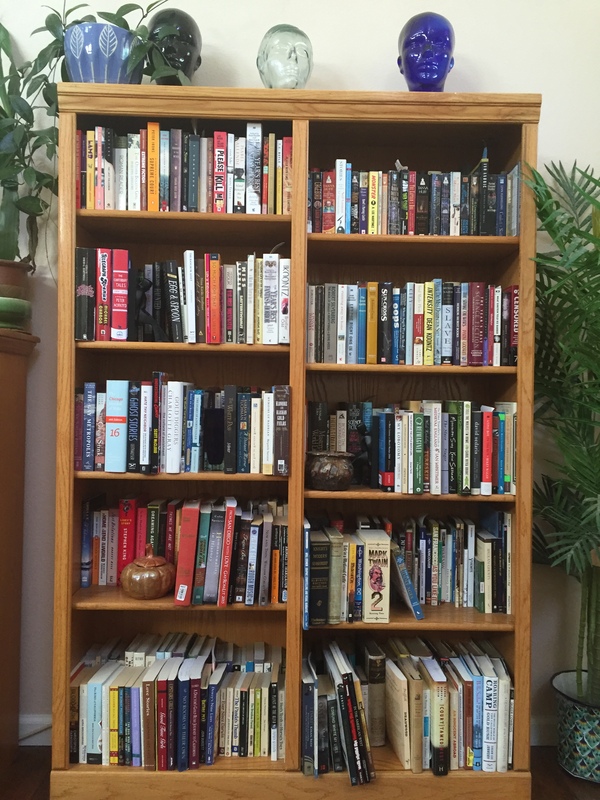 Next post: my family’s bookcases! I thought it would be fun to lead a bookshelf tour of my house. Due to the large number of books involved (nope, we don’t have a problem; no, not at all), I’ll post over a few days. 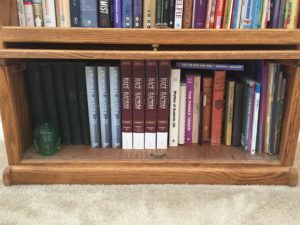 Let’s begin with the case where I keep some of my most prized books. The top shelf doesn’t have books at all, but instead some of my Saint Bernard stuff. I think I’ll have to move the dogs soon because the other shelves are almost filled to capacity. 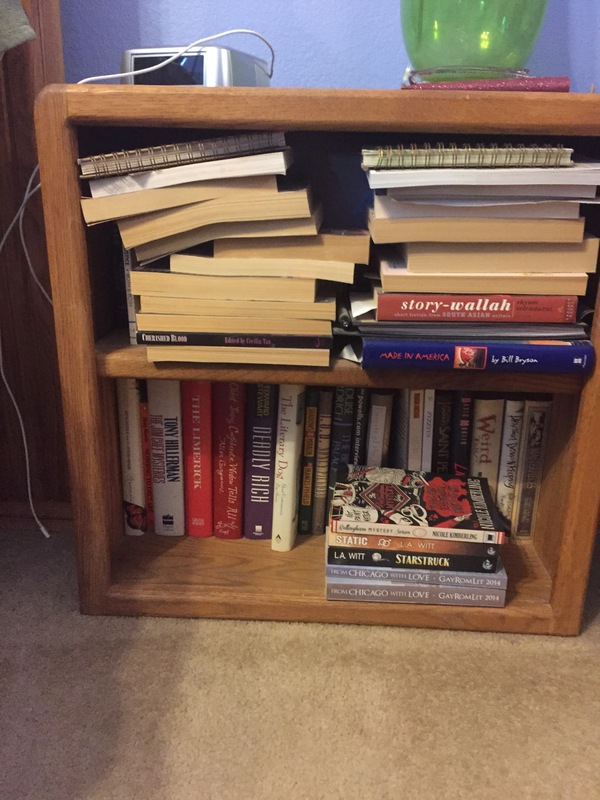 This is my vanity shelf–everything there was written at least partially by me. I am so thrilled to watch this shelf fill. I get especially excited over translations because for some reason, having books in translation has always seemed to me to be a mark of an author’s success. I love this shelf too. The leftward two-thirds of the books are signed by the authors. In many cases, the authors are friends of mine, which makes the books even more special. The remaining books are part of my small collection of children’s books in languages other than English. And wow, that shelf is dusty! The bottom shelf is a mixed bag. 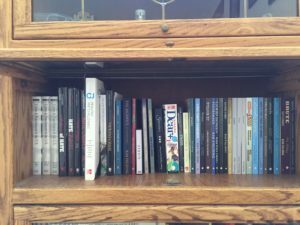 Mixed shelf. Something. On the left, a really old set of Dickens. Next to that, some academic books I had a part in. Then some other old books I’ve collected here and there, plus the rest of the children’s books. I’m a worrier. I plan for things and then make backup plans, just in case. And I don’t often take risks. Ah, but some risks are worth taking. Like the one I took in early 2012, when I submitted a novel to a publisher for the first time in my life. That time I had encouragement from family and good friends, and from an author I really admire (thanks, Amy Lane! 🙂 ). I still worried. But Dreampinner sent me a contract for that novel, which was Good Bones, and here I am today. 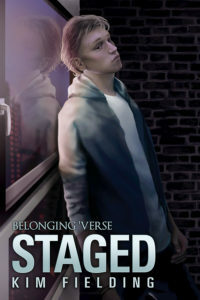 Here I am today, July 18, with my 15th novel releasing! Staged has been a risk, too. I had read Anchored and Counterpunch, novels set in an alternate universe much like our own–but where slavery is legal. I really enjoyed both books. And then a plot bunny from that universe hopped right up to me and bonked me on the head. Hard. I emailed Rachel Haimowitz (the publisher at Riptide and the author of Anchored) and asked whether I could try writing a book in her ‘verse. She very kindly said yes. And this was my first risk, because if she didn’t like the book, I wouldn’t be able to publish it elsewhere. There would go several months of my work, down the drain. But that plot bunny was in cahoots with my muse, and they were very insistent. So I wrote. I had a wonderful time writing this book. And that risk paid off in the end because Rachel liked the book and sent me a contract. Yay! But now we come to the second risky aspect. Staged deals with darker subjects than most of my books. Sky Blue, the protagonist, is a slave. Some really bad things happen to him. They were difficult to write about and, for some people, might be hard to read about. 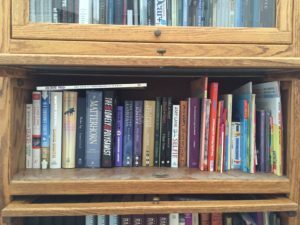 What if I scare readers away? Here’s what I can promise you about the dark stuff. It’s there because it has to be. I don’t dwell on it more than necessary. And the characters’ reactions to that stuff are genuine and, I think, realistic. There is romance in this story, albeit an unusual one, and an HFN ending. Why did I write this? Because as an author, I have to write the stories that come to me. Sometimes that means sweetness and light. Sometimes–and yes, I’m looking at you, Tin Box–those stories are difficult in parts. My hope is that readers take a chance too, maybe trying something a little different, and that in the end you find that the risk pays off with a good story and memorable characters. And there’s a blog tour with exclusive posts and a giveaway. Click on the banner or scroll down for the complete schedule. This summer has been crazy with travel, kid stuff, evil day job drama, and more. I also have several projects in various stages of editing. 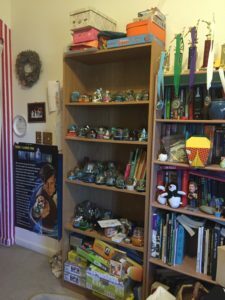 So I haven’t been blogging. But today I have exciting news to share: a new audiobook release and an upcoming new novel! The audiobook first, since it just came out today. Treasure is the perfect summer listen, with a secluded beach, a mysterious man washed ashore, dastardly pirates, and a bit of magic. Joel Leslie has done a terrific job narrating it. And all my royalties go to Doctors Without Borders. Here’s the link on Audible. It’s also available on Amazon and iTunes. But perhaps you’re in the mood for something darker. In that case, Staged will fit the bill. It’s set in an alternate universe very similar to our own, but where slavery is legal. It releases July 18, but if you preorder now from Riptide, you’ll actually be able to download it at midnight on the night of the 15th. 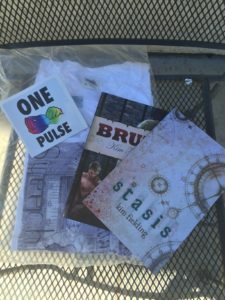 To celebrate, how about a giveaway? 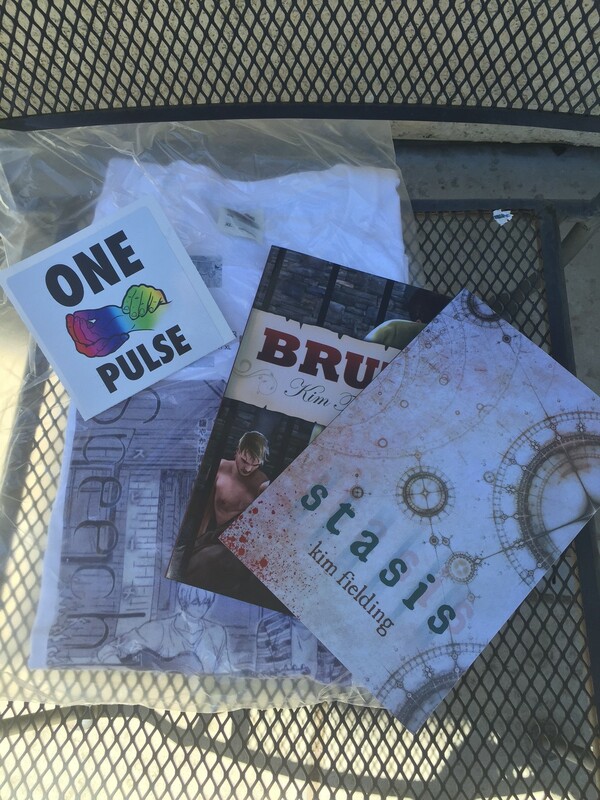 The prize package includes a T-shirt (size XL) featuring the fantastic cover art from the Japanese version of Speechless, signed print copies of Brute and Stasis, and a One Pulse sticker (designed by Paul Richmond in support of the Pulse victims). Due to shipping costs, I’m afraid this contest is open to US residents only. However, I’ll pick a second winner from the comments to receive a $10 Riptide gift certificate, and that is open to entrants worldwide. Just comment on your summer reading plans, and make sure you leave your email address in the comment so I can contact you if you win.